I Feel a Launch Coming On!…or…It’s Here! It’s Here! 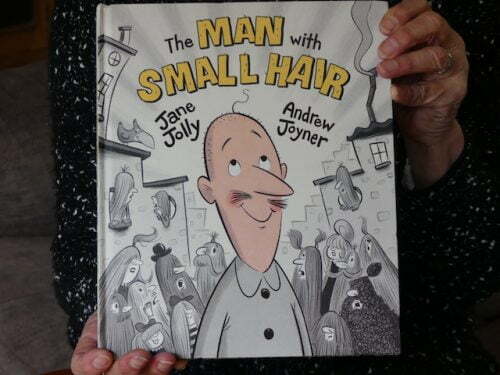 Yesterday I went to the letterbox and found my advance copy of The Man with Small Hair. Just as well I have a large letterbox because it meant I didn’t have to go down to the Post Office to pick it up. So after all this time the book is finally a hard copy book and it looks FABULOUS! 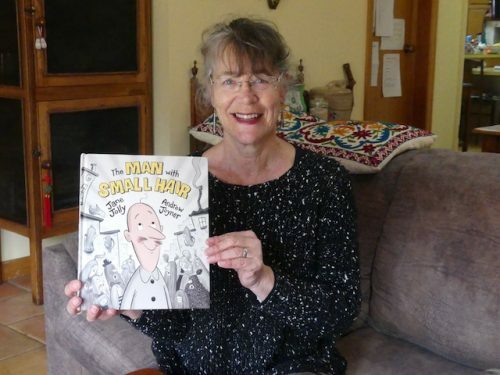 Illustrated by local Strathalbyn illustrator Andrew Joyner and published by Little Hare, an imprint of Hardie Grant Egmont. The illustrations are just superb, with so much detail to look at in the background. It has arrived just in time to start sharing with schools during Book Week visits, which for me begin next week. I did share it with Toffee who was interested for a while! Can’t wait see it in shops and to officially launch it…probably late September or early October. Congratulations Jane, it looks amazing!! Love the title. Love the cover. Can’t wait to get this. Congratulations, Jane! Thanks Kaye, Yes it is very different to all of my other books. I think you will like it. Thanks Alys, it is a lot of fun this book! And Andy’s illos are super. Wow looks great Jane! Congratulations! So proud of your achievements! Thanks Kim. Will bring it in on Thursday!